Should you weigh yourself every day or not? There's that old question. Some experts say that you shouldn't weigh yourself too often. Why? They worry that you could get discouraged. Because weight goes up and down all the time. So one day you are a pound lighter. Good! But the next day you are two pounds heavier. Awwgh! No! The reasoning is that you will get feel bad on the days when it is up and feel so bad you just give up. The usual recommendation is to weigh yourself on a schedule, once per week. But is that really the best way to go about it? Here's an example that happened to me. A few years ago I had put on about 10 pounds or so. That happens to me when I start to work out harder. If I lift weights I tend to gain weight. Now, most of it is muscle, so I am stronger and I like that. But some of that extra weight is fat, and I don't like that. See, I was going between two weights, one where I am about 5 pounds lighter and look the best, and one where I am 5 pounds heavier and I am stronger and I feel the best. But I was on my "up" phase and I decided to take off about 10 pounds. I gave myself about 3 months to take it off. Any faster than a pound a week and I feel weak, my heart races and I am hungry all the time. But a pound a week is fine. I increase my exercise a little, cut out a few of my treats, and the weight comes off. And I don't feel hungry. Anyway, I was working on taking off the 10 pounds, right? And I was weighing myself everyday. Did I lose weight? No!! I got 2 weeks into the program and I was 4 pounds over where I started!! I was way above where I should have been. But I knew I had a good program. I was following it. And I knew that the scale goes up and down. So I stuck with it. I didn't make any changes. What happened? The third week I dropped 7 pounds. In one week. BAM! It just all dropped away all of a sudden. Same program. No changes. By the fifth week I was exactly on schedule. The weight just melted off smooth as can be. But we were talking about scales, right? How often you should weigh yourself? Here's the point. When you keep a graph (and you should keep a graph--it is one of the most important things you can do to help yourself lose weight) you are going to see that your weight goes up and down. You know what? That is normal. It is normal for weight to go up and down. Your weight can go up 3… or 4… or even 5 pounds a day! But hold on! It's not fat! When you are up 5 pounds in a day it's not fat. What is it? It's mostly water. And it's the food you just ate. Of course you feel better on the days when you take off 3… or 4… or 5 pounds a day. But I have to tell you -- that's not fat either. Sorry. It's mostly water weight. Up a day. Down a day. Sometimes it's up for several days. But then it will come down again. 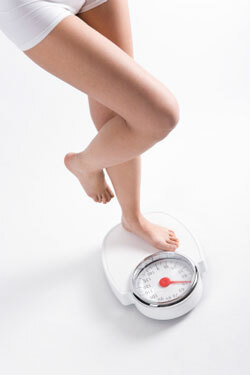 When you are on the scale you are at least facing the problem to some degree. If you're not doing anything else, at least you're on the scale. What happens if you don't weigh yourself? A year goes by. Your clothes don't fit. You haven't weighed yourself in a while. You're shocked. You're up 10 pounds… 20 pounds… even 30 pounds. You know what I am talking about. It's a terrible shock. But it doesn't happen if you are weighing yourself every day. At least you got on the scale. At least you are keeping an eye on things. At least you are still facing the fact that you have to do something about your weight. And that is a first big, really big step. You are facing it. You are doing something. So yes -- weigh yourself. Weigh yourself everyday. And you'll be on the road to having the body you want!